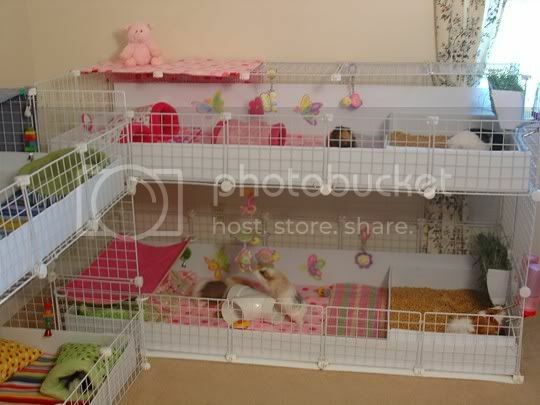 Now with the exception of the two boys' cages, all of my setups are like this. I no longer use the fiddlesticks because Allie started peeing on them everytime she entered the kitchen. Yuck! Pans are a seperate piece of coroplast and just come out of the cage for me to dump them. The herd has a 2 x 3, the two girls cages have a 1 1/2 x 2 pan. The wood pellets has made the cage much cleaner. It does not track like Carefresh or shavings. I do have to dump them every two days or the dust from the breakdown of the pellets begin to track out of the kitchen. I just wish I could find a way to keep the hay now in the kitchen area. *sigh* I really think it is a nonwinning battle. I am out numbered BIG time. What sort of wood pellets do you use, WEAVER? I use Equine Fresh. You can purchase it from Tracor Supply. So, camende...your window's not working properly. Hmmm? So when do you work? Bawhahaha! I do live close to Laketown area. I've lived in this area ever since I moved to Springfield over 16 yrs ago. I know the area the best. Girls' school is over here, too as well as DH's family. Anyways, here are a few past kitchen areas. We had this kitchen area w/ 3-5 piggies. This is when there were 8 piggies in the cage. This is a newer version when there were only 10 piggies. This is Mylie, Puddin, Sasha and Holly (sitting in the hay box) eating. Here's the big pile of hay where 10 piggies reside. And believe it or not there are 6 out of the 10 eating it. So many great ideas on this thread! You guys have successfully scared me away from any and all hayracks. Geepers some pig has gotten stuck in all of them! I finally found those cute BB&B trashcans that people use for hay and couldn't convince myself it wouldn't bring my babies to an untimely (my fault) death. Piles are a giant mess, but I am such a scardy cat. tracis, that's why I got rid of mine awhile ago. I wasn't going to take any chances w/ them. I wanted to post the warning so that anyone who is not familiar with the story will understand the potential risk. The BB&B trashcans are what I use and I have never had a problem with them. Ocassionally, the pigs crawl into them but the space between the bars is so wide that they slide right through. I suppose if Willow keeps getting fatter I might have to reconsider. 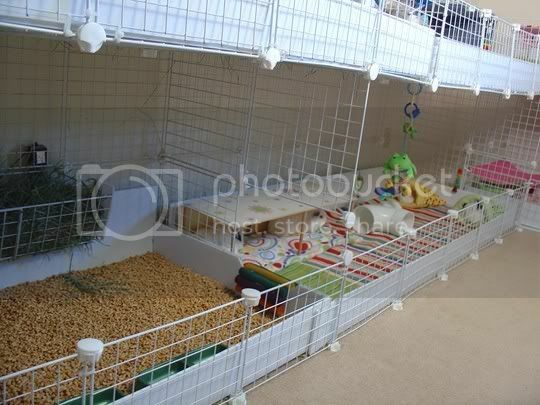 I might reconsider anyway because I have decided to modify the cage. I have decided to re-configure my cage to make an L. I measured the room and I can fit a 2x8 section on one side and 2x5 on the short side of the L. I will have more room in the middle of the room. I might actually make the kitchen area smaller so I can used less bedding and more fleece. In general, the piggies pee and poop all over but I like the kitchen area so that the hay doesn't get on the fleece. L- shapes are great Camende. I love mine. DO be careful though if you have it all attached. That back corner will be VERY hard to reach to catch pigs and to clean. Mine is actually two seperate pieces and I can slide the entire 2 x 5 section forward and than slide it back into the corner when I am not usine it. I have completed my plans for the new cage. It's going to be an L.
It will be 2x8 on the long side and 2x5 on the short side. I was planning on making the 2x5 all bedding but then I was thinking how hard that back corner will be to clean. So, I am going to make the entire 2x5 section (short side) fleece. This includes the back corner. The "kitchen" will be on the Long end and I think I am going to reduce the kitchen to a 2x4 section. so, looking at the cage, the long side is straight in front of you and the short side is to your right. The kitchen 2x4 will be on the left side (I need an end for the 5 water bottles) Then a 2x4 section of fleece that includes the corner and the remaining "short side" is a 2x3 section of fleece. I have to decide if I want hayracks or if I will just plop the hay down. Camende, if I can make a suggestion for you. You could keep the 2 x 5 right side the kitchen area and have it easy to get to, if when you connect the 2 x 5 to the 2 x 8 you move the 2 x 5 forward one grid and just have the entrance to the kitchen area one grid wide. Let me go and get pictures of my cage to explain seeing our cages now are going to be the same size. Photobucket is acting all crazy right now, but the picture I was going to post is actually already shown on the top of this page so let me try and explain the best that I can. My girls cages are 2 x 5 and I used a sheet of thin wood under them and attached that to the cage to be able to slide that whole section in and out so I could reach the back section for easy cleaning. When I had gotten the three girls (Emma, Rosa, and maggie) I was hoping that they would get along with the larger herd, but Emma was being a problem. My plan at that time though was move the whole cage forward one grid and take out the front, side panel to allow access into that cage. I always make my kitchen openings to get in one grid wide anyways to help keep the stuff in the kithen and not on the fleece. It would be like this, but the panel above the green bed would be the opening to the kitchen. (notice in the back corner you can see the carpet where the cage is not there). Than you would have no back corner to try and clean or catch pigs. I am only 5'2" and can reach easily to clean the cages and play with them. My hay rack is just a plastic stacking bin high on the sides and back and low cut in the front. I bought them for 2.50 a piece at Big Lots. Marsha, I have no idea what you mean! I will say that one reason I was thinking about moving the kitchen to the long part of the "L" is that the short part of the L is right by the door going into the living room. If the kitchen area is there, and there is hay on the floor, they you track it into the living room. This cage is going to be detachable. I am going to be able to modify it as needed. OK, back to work. I have one side done. I also made the DH hang some artwork on the walls above the cage. Very very light pictures. But it will brighten up the room. I am taking pictures as I go. Camende, I can't wit to see! Wait! I know what you mean, Marsha! I think I will still leave that section fleece but it makes so much sense to do the single grid in the corner. Glad you got it! I have such a heard time trying to describe things. Sorry I am so confusing. I posted pictures on the "show your cage thread". I am very proud of the cage. It looks great and I love the storage underneath. Thanks for your suggestions. When I mentioned it to Ted, he said he had already thought of that but he wasn't going to say anything because I seemed to know what I wanted. Men!